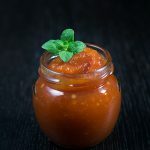 Tomato marmalade or chutney, perfect to accompany savory dishes, cheese plates and more! Score the bottoms of the tomatoes and put them in a big pot with boiling water for one minute. Drain, add tap water to cool, and peel them off. Cut them in half and discard any hard white parts. Puree them. In a wide, heavy bottomed saucepan add the tomatoes, sugar, vinegar, salt and geranium leaves. Simmer in medium heat stirring occasionally (and more frequently during the end). When it is glossy and thick enough to spread, remove from heat and discard geranium leaves. Let cool a little and transfer into a jar. Refrigerate. Spread on bread, toast, muffins, cheese and eat. During cooking you test for doneness by dropping a small quantity on a cold plate and checking the consistency. Remember that when cold, it will thicken a little more. It is better to undercook it than to overcook it. If you undercook it, you can always boil it a little more! Cooking time may vary. It will depend on the type and size of saucepan, how juicy the tomatoes are and other factors.